It's official! 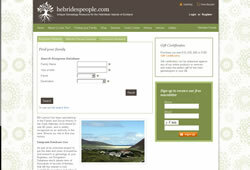 After a trial period of a few weeks, the new emigrant website www.hebridespeople.com was formally opened on Friday 20th June 2012 at Seallam! Visitor Centre in Northton, Isle of Harris, by George MacKenzie, Registrar General and Keeper of the Records of Scotland.